I should probably start by saying, a few months ago my Mum and I took Ophelia to the beach and she did NOT like it. AT ALL. She held her feet up when we put her on the ground in a very defiant manner, and her face was a not-so-pleasant-picture. Last weekend, Callum and I fancied a stroll down to our local seafront and decided to try again. This time was a success! (Thank.God). Last Summer we used to spend every day strolling down that part of the beach and I like to think she recognised the smells, she got clearly excited as soon as she saw the sea! We carried her chariot (pram) down the pebbles to the sand and she was already desperate to walk. She toddled around, picking up shells and pointing at the sea. We then took her down to the waves, took off her socks and shoes and waited for the waves to roll in. She was quite skeptical of the waves, being in them at least, but she loved watching them and watching Callum and I racing in and out of them. She of course loved picking up the stones, feeling the texture in her hands and it of course wasn't long before they ended up in her mouth! She loved it when Callum or I made a shower of pebbles and banging them up against one another. Last time, she really hated the feeling of sand on her feet, especially when it stuck to them but this time she seemed to really love it! She spent a while brushing her hand up and down her feet and then swishing her hands in the sand. The next day we headed to our local park, she loves the swings but never really usually engages with much else except chasing other children around. This time she again loved putting her hands in the sand pit (yuck!) and climbing up and down the slide. What is it with children and insisting on climbing up the slide the wrong way?! We then wandered around the green, looking at the trees, leaves and grass; just giving her the freedom to discover the world at her own pace. It's no secret that this kid LOVES trees, whenever we walk past them she points and reaches to touch them! On this particular occasion she didn't get distracted chasing dogs to stroke them (! ), but instead loved touching the grass and watching us throw it in the breeze. She was so content just embracing being outdoors, it was so delightful to watch. What fun have you been up to outdoors? Brio giraffe pull along: This was meant to be a Birthday present but she was ill and bored so I took pity on her and gave it to her! It was amazing to see her little face light up when she saw it! She has the most expressive face and inquisitive nature and she couldn't help but grab the giraffe to explore moving it's head and fiddling with his ears. She particularly loved it when I pulled it backwards and fowards in front of her and she insisted in holding onto it whilst she led me around the house. Jeez my heart melts! I love how well made this is and you can tell it can handle some ineitable bashing! 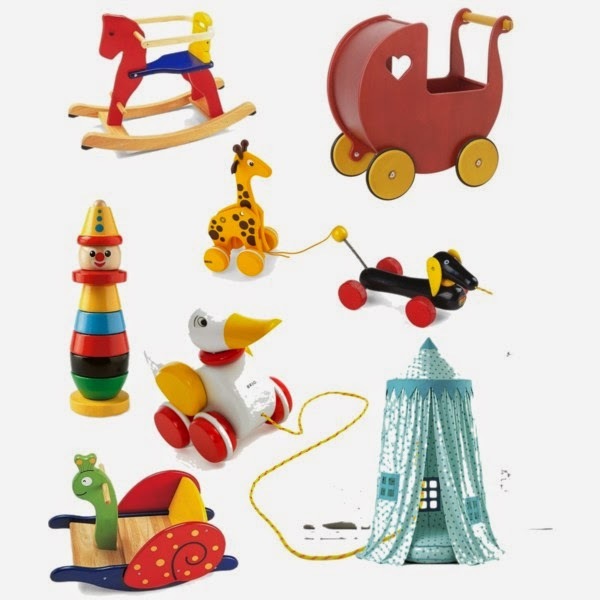 Wooden shape sorter: We currently have one like the above, I happened to pick it up from Asda SO long ago that I forgot about it and asked Lauren to pick up a house shaped one from Ikea! Oh well, you can never have too much organisation right?! Ophelia currently appears to mostly enjoy taking the lid off, bashing things (usually me) with it and attempting to put shapes through random holes. Cuddly toys: She still continues to be OBSESSED with anything cuddly! Apparently at the Nursery teddie picnic the other day she barely left the side of a giant bear! She has recently started to carry them around with her or hold them by their tail and bash them on things- it is rather endearing to watch, although I do wonder what she may do to the cat based on this! 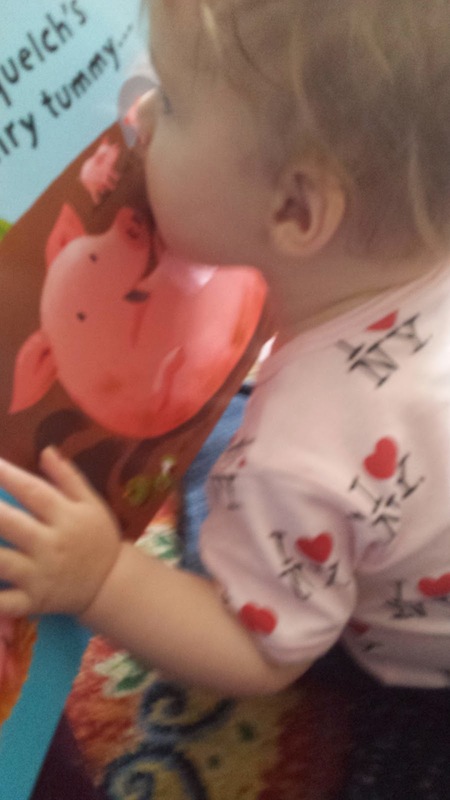 Role playing games: She just loves using items to pretend; I often catch her reinacting things with her cuddly toys or bath toys and at nursery she loves the play kitchen so i'm definitely compiling a "wish lift" on her behalf- I think pretend play is SO crucial to good child development. Figure dolls: Ophelia appears to have adopted my Princess Bubblegum funko doll and loves putting her crown in her mouth and flinging her around! 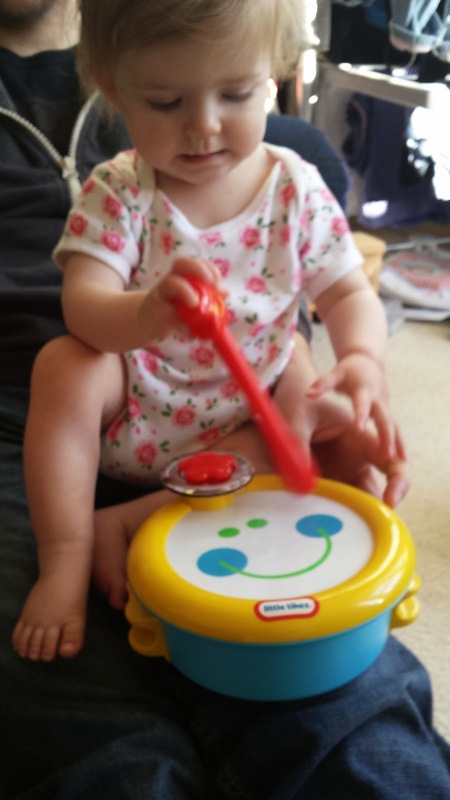 So there we have it, the top 5 toys that my daughter loved when she was 11 months old. I can't wait to see what she likes next month! Which of their toys were your child's favourite at this age? She loves cats: Poor Inara is usually found trying to back away from the kid now that she can move towards her at a rate of knots and then shouts in her face/pulls her hair etc. Ophelia's Aunt and Uncle have kittens and they are not yet wise to this, thankfully they are fast so tend to run away! Watching her pure glee at seeing animals is just so great and fulfilling to watch, it really is clear to see why it is important for kids to grow up around animals. 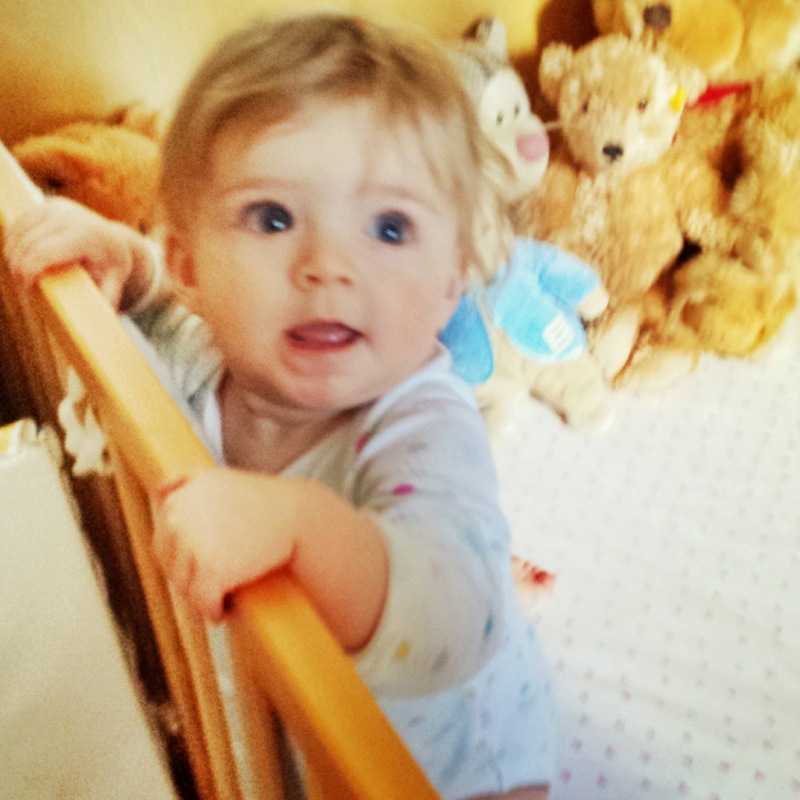 Inquizative nature/nosy: When she was merely weeks old I remember the midwife telling us she was unusually aware and awake for such a young baby, this continues to be the case. She cannot get enough of her surroundings and now she is able to climb, stand, crawl and step she is really able to get her nose into anything and everything. 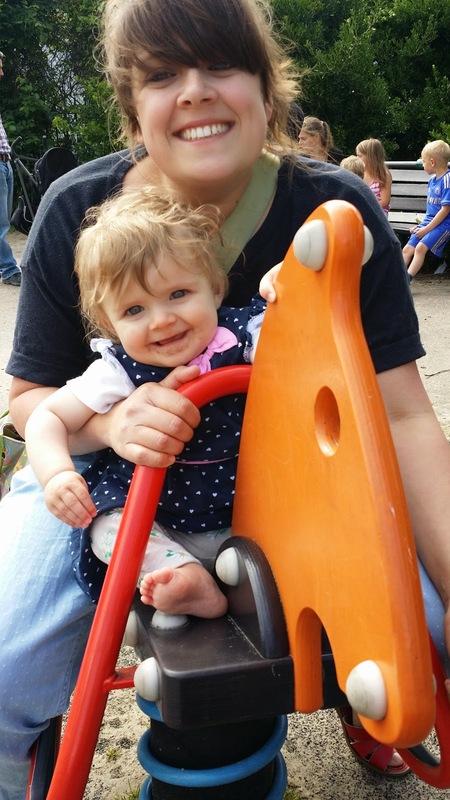 For this reason she generally prefers to be in the pram or carried by hand but today I tried her in the Ergo as a back carry and she was enthusiastic as she could look around more freely than the front carry allows. 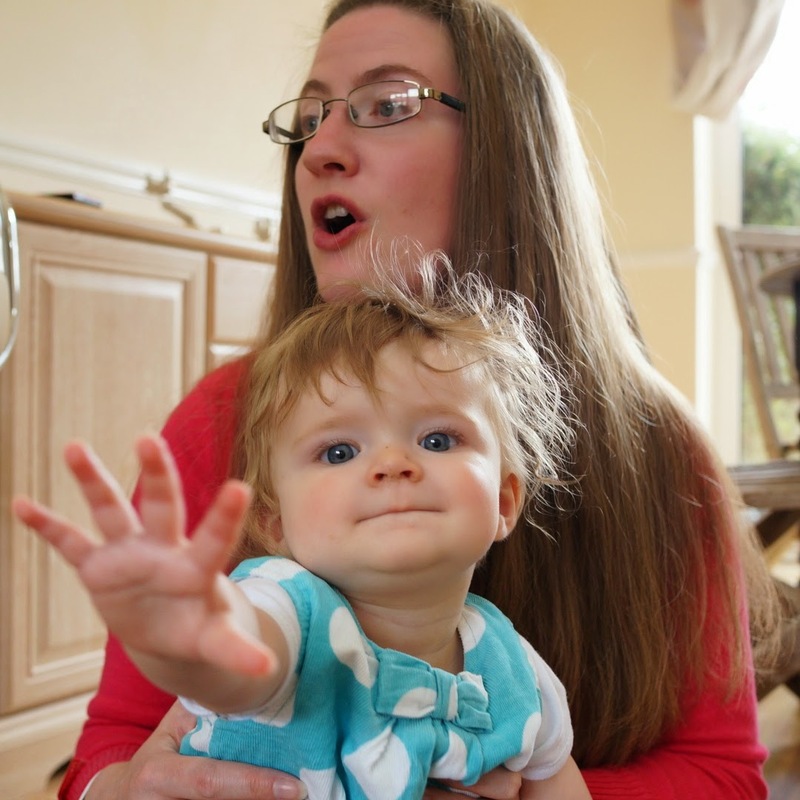 Obsessions: I've noticed she can get quite obsessed with doing things and currently that seems to be opening and closing doors- I think this is quite common with babies though so it's hardly surprising! LOUD: She loves being loud and loud objects- current favourite toy being the drum, stick and maraccas. 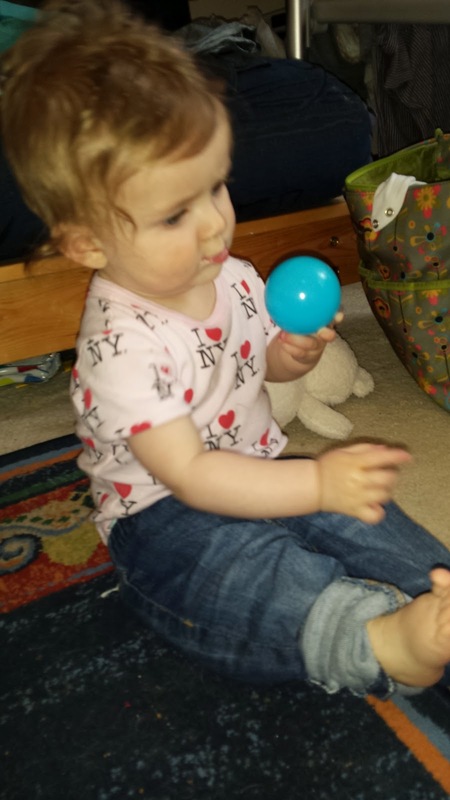 She especially loves hammering the marracca on the floor at 5am and shrieking in glee-I bet our neighbours love her! Toothbrush lover: She has got a bit obsessed (See above!) 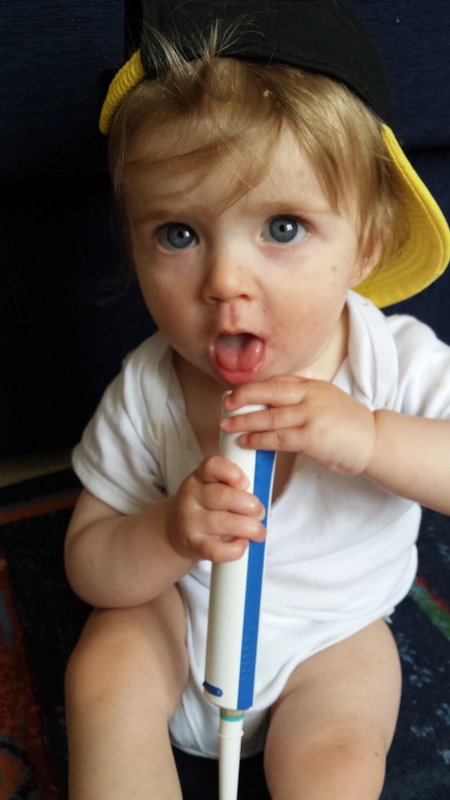 with our electric toothbrushes, so much so that we actually have to put her in her highchair whilst we brush our teeth because she gets far too excited and snatches them out of our hands! Attention seeker: This kid loves attention-I mean, I know all kids do but this one full on performs! Every morning (sometimes night!) we are greeted by the above view (but the smile is replaced with crying!) where she stands and shouts forever until we get up! She watches your reaction to every single thing- especially when she is doing something she thinks we might consider naughty. For example today, she went to chuck all her rice cakes out of the packet and I said "Ophelia" in my firm voice- she looked around at me, gave a little smirk and carried on watching my reaction as she proceeded to turn the contents all over the floor. I then said "no" and so she carried on and smiled! I of course have the discipline skills of a ferret and end up laughing-which i'm sure will not at all encourage this cheeky behaviour! Vanity: She L.O.V.E.S cameras and it is slightly worrying because she now actually poses for photos! If anyone has a phone or camera God help them because she'll grab it out of your hand faster than you can say FLASH! 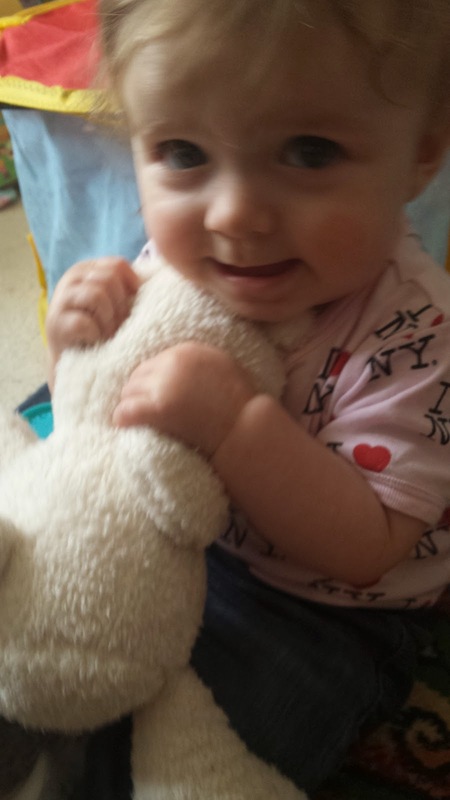 She loves cuddly toys: I think it's very likely that this, and her love for furry animals are connected because her... deminar towards them are very similar! She basically gets ridiculously overly excited, screams with glee, manhandles them (usually by their ears) and babbles in their face. Poor Inara! She hates hats: I have yet to work out if she actually hates hats or if she just thinks taking them off her head is a game?! Either way, without fail every time we put a hat on her head it barely lasts a few seconds before she yanks it off. That is unless we put it on backwards which delays the process as sometimes she seems to forget it is there! Either way, she finds it hysterical to get locked in this on/off battle- a bit like how HILARIOUS it is to drop things over and over again. She's a walking dustbin: Modjool date anyone?! She takes things out of my hand/off my plate/out of her bag before I realise- this resulted in a LOT of jelly all over the kitchen a few days ago as she decided she would "eat it" straight from the pot. She refuses to sit down in the bath: ANNOYING! I'm not a believer in bothering much for children's first few birthdays; how many of you remember anything that happened before the age of ...12?! Okay, bit of an exageration but still! Having said that, there are a few things that I Ophelia really want need. Top of that list; some form of teepee/tent hang out- I've seen a great educational one(she LOVES to read in the one at Nursery), a rocking animal, more books and a pull along. There were a few other things (including a dollhouse) but its probably a good thing I've momentarily forgotten! When Ophelia has her own room, I'd love for it to be brightly coloured and I plan for the interior to compliment her cupboards and dressing table which were handed down to me by my Nan. They are a gorgeous rustic oak wood and have a woodland scene on them, I did think about having a woodland theme room but I think that'd be a bit much! Sorry about the distinct absence around here, I've been rather busy with this one and being rushed off my feet at work (booo). She has been turning into quite the character and Nursery recount many stories with me about hilarious things she has done throughout the day. Today I watched her get ridiculously out of control when she saw a giant teddy bear (staff dressed up as a bear); she swung between desperation to touch it, laughter and confusion. She is so interesting to interact with and watch nowadays; the way she looks with amazement, interest and intrigue at objects is just fascinating- imagining what is going through that little mind of hers. Ophelia is particularly keen on cuddly toys at the moment; this mostly involves banging them on the ground but she also gets ridiculously excited if you bounce them towards her or make them have funny voices. She really does love banging everything though, just today at nursery we witnessed her munching on an orange whilst trying to bang a block of wood into her mouth. Her imagination seems to be going into overdrive and she spends ages trying to fit items into cups as well as pull the contents of tables all over herself (there is a rather worrying amount of determination and strength involved in this one!). At the moment she is really interested in exploring others (!) and is a bit obsessed with digging her finger nails into our inner noses and lips, this really is quite painful I tell you! She also really seems to love playing with my tongue with her hand, rather odd again! I keep catching her looking at her hands and fingers whilst she moves them, it makes her appear quite profound and like she is performing shakespeare! She loves all the other kids at nursery and they love her too, today I witnessed a child hand her a toy whilst another boy came and sat right by us to play (please don't tell me she has a boyfriend already!). She appears to have got over her weird phobia of getting her hands dirty and now likes to get "stuck in" at any oppotunity, the other day this involved soil to plant a seed and today it was chocolate whilst baking. She loves to give me ridiculously wet, sloppy kisses on my mouth which is sweet if not slightly gross! I guess I should enjoy it whilst it lasts! I really do love this kiddo and watching her personality develop more and more each day, even when she spends all day saying "Dadda"non stop, right up until she falls asleep! Whilst she isn't even 9 months yet, I often find myself uhming and ahhing over whether we will bother properly celebrating Ophelia's 1st Birthday. Mostly I fall towards the "no" corner purely because she won't remember it and I don't have time to eat let alone plan a party. But several things have swayed me towards the "yes" corner; namely the fact that there is a possibility we may have a garden to play and heaps more space but also that Callum's mum bought her a dress that is screaming to be worn on her first birthday. Plus, I might as well plan it before she demands Peppa pig. Look at that cake! I love the idea of different coloured foods although perhaps natural rainbow coloured foods as opposed to E numbers?! This site is GREAT for party inspiration! I love gingham and love any excuse to get involved in it so imagine how carried away I would get incorporating this into the theme! Obviously eating is the main priority! 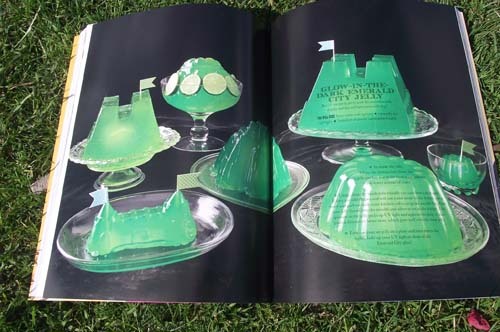 Green luminous jelly?! Iced gem cookies?! Rainbow cake? Cherry pie?! Hells yeah! I love the tassel garlands and these colours look so fab together! 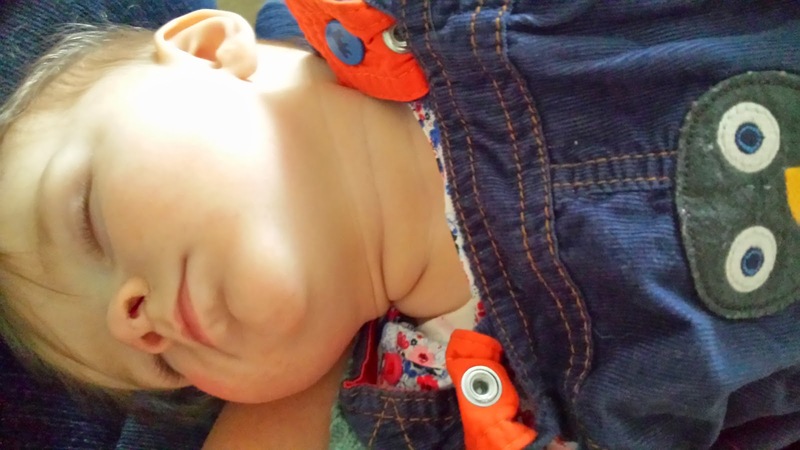 I've talked briefly before about our bedtime routine and Ophelia's night time habits but this time i'm linking up to Kerry's share it Sundays about bedtime. Let me begin by saying that I always knew I would need to return to work, so I knew how important it would be to get Ophelia into a routine so that I would have some chance of functioning! My job is fairly stressful/dangerous so the more sleep the better! You can imagine how much of a mountain I had to climb then when, after 24 hours of labour and 36 hours of no sleep we brought our daughter home and she did not want to sleep. I kept hearing "ohhh I love it at that stage because all they do is sleep", oh no no no no no, not this little lady and especially not at night time! After a while, this did pass but not without some extreme routine building! We stayed quite strict with the routine and I think if we had just gone with the flow, I would still be going to work now with no sleep! At first she slept in a carry cot type thing and we used to roll a towel into a U shape, popped it in the cot and snuggled her body into the shape before tucking a muslin over the top. This worked really well (she hated being swaddled) at making her feel secure and sending her off to sleep and we transferred this same technique to the cot when she moved into that. At first when she was teeny tiny, she really didn't like gro bags, but we tried again when she was a few months old and we have been using them every night ever since. 6ish: Start getting everything ready e.g. bottles out of the fridge, hot water, run bath, boil kettle etc. Wind down by reading a book. Give bath/wash down and put sleepsuit on. 7-7:30ish: Put to bed and always give her a kiss goodnight. Ophelia never used to be able to settle herself to bed and it was quite the laborious exercise so I can see why some parents decide to feed to sleep/rock to sleep/co sleep etc because it ain't pretty! But always at the back of my mind was that I was going back to work and all those things would simply make my life more difficult further down the line- obviously if you're not going back to work relying on those techniques probably isn't an issue and is probably quite nice! I also never liked to co sleep for a massive safety issue-on a nightly basis I kick/talk/shout/move in my sleep and so I wouldn't trust myself to not do any of those things to her by mistake. Like anything with children, i'm sure this will all change as time goes on and even when she was ill last week it completely set her off kilter and regressed. 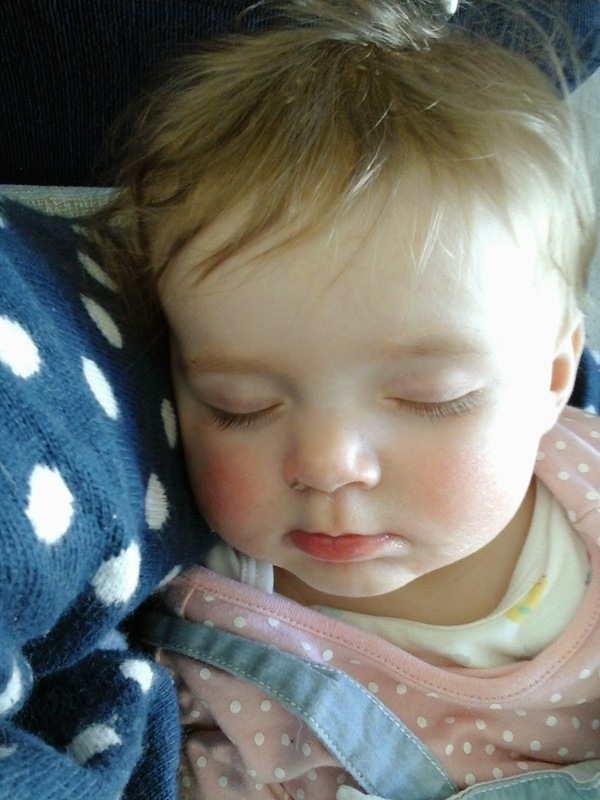 I in fact ended up letting her sleep on my chest all night, so then sleeping in her cot was evidently unappealing! But we persevered (I survived at work by having 5 strong coffees a day!) and she now seems to be back into her normal routine (touch wood). 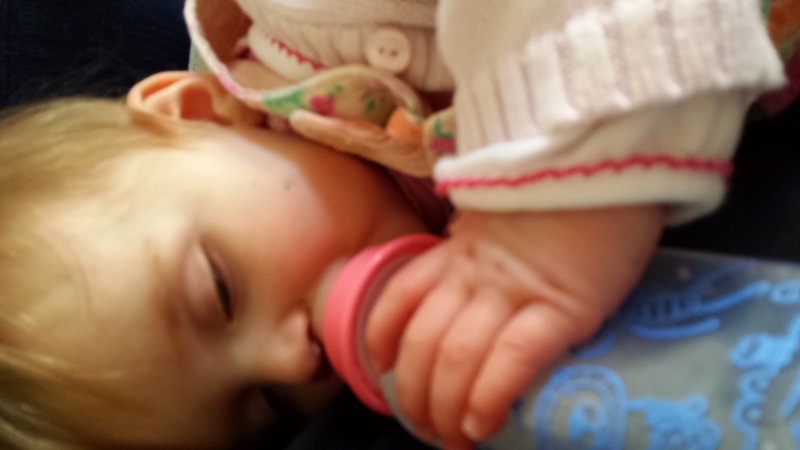 The length of time she sleeps still varies a little bit; sometimes she stirs quite a lot but gets herself back to sleep but other times she wakes up at 3ish or mornings like today when I was awake before she was (7:30am!). So that's our bedtime routine story! It works for us and for her, although it isn't neccesarily what I imagined I would do prior to having her! I joined the blog hop!